Oil on canvas, 80 x 100"
Robert Motherwell was associated with a group of artists in the late 1940s and 1950s in New York who are now referred to as Abstract Expressionists. The term, although they did not like it, aptly describes their painting: abstract (usually to the point of being completely nonobjective), and an attempt to express feelings and moods through these abstract forms. Influenced both by current trends in modern European art (especially Surrealism, which focused on dreams and the unconscious), and the devastation of World War II, the Abstract Expressionists developed the first artistic movement that was completely American in origin. With Abstract Expressionism, the center of the art world shifted from Paris to New York. Representational art was no longer believed to be an adequate expression of the mood of the times. The Abstract Expressionists chose instead to use color, line, and texture for purely expressive purposes. Because of the extremely personal nature of the style, each artist’s work is distinct, based in part on their individual goals. Motherwell wanted to combine the conscious world (the world in which we live) with the unconscious; he thus linked many of his abstract forms to the conscious world through his titles. Motherwell painted more than one hundred works in the series "Elegy to the Spanish Republic." Each image in the series contains black, vertically oriented elements alternating with ovoid forms, and refers to the Spanish Civil War, which lasted from 1936 to 1939, leaving fascist dictator Francisco Franco in power. 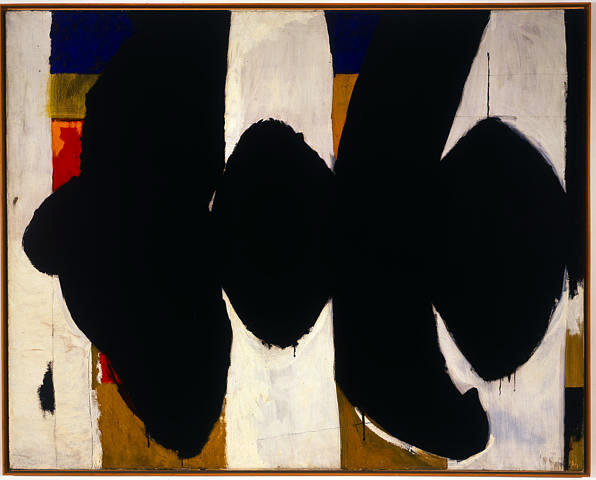 Motherwell began the series in 1948, almost a decade after the war’s end, but recalled "I was twenty-one in 1936, and that was the most moving political event of the time." Motherwell’s studies in philosophy, psychoanalytic theory, and aesthetics (Stanford, 1932-36; Harvard, 1937-38; Columbia, 1940) are reflected in many aspects of the "Elegy" series. For example, the black-and-white contrasts that dominate the image could refer to night and day, death and life, and oppression and freedom. This last interpretation is underscored by the colors in the background, those of the flag of the Spanish Republic, which are being blotted out by the black forms in the foreground. Although Motherwell stated that the "Elegies" are not political, he did say that they were his "private insistence that a terrible death happened that should not be forgot." There is a tinge of nostalgia for a lost cause in these images, and the use of the term elegy emphasizes this sense of loss and death. An elegy is a short funeral song or lament—slow, meditative, and mournful. The rhythm of an elegy could be compared to the type of rhythm seen in the black forms moving slowly and solemnly across the canvas, marking the death of freedom for the Spanish people.